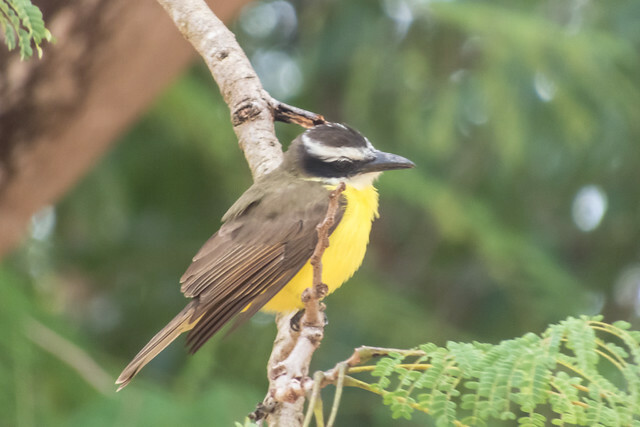 Is this guy, seen near Cancun, a Boat-billed Flycatcher or a Great Kiskadee? I *think* it's a Kiskadee. I think I see rufous edging to the wings. This is intriguing. I think I "need" to buy some field guides for other countries one of these days. I just did a little searching on either as my daughter saw the picture and was confused. The markings on the head don't look right for great kiskadee... Never heard of the boat-billed flycatcher so I looked it up. Their bill is much larger than what I'm seeing in this picture. I looked at all about birds as well as the macaulay library to see pictures of the great kiskadee to see if maybe their young might look different or something. Found no information on it so far and no pictures to support that idea, so far. I'm going to keep searching, starting with wikipedia's list of birds of mexico... ha. The pattern on the boat-billed is similar, but again, their bill should be bigger from what I looked at. This guy is a bit confusing to me. I am not an expert (which is why I am asking you guys 😉) . I had wondered about the rufous on the wings. Looking online, some pics of Boat-billed Flycatchers do seem to contain a bit of rufous on the wings but, yes, this guy seems to have a lot. I wasn't comfortable with Great Kiskadee, though, because to me, the beak seems to be too fat and is the wrong shape (it seems to have a slight, downward bend to it). 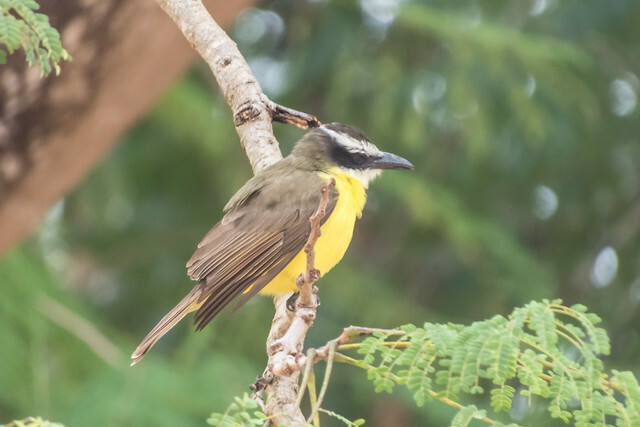 A Great Kiskadee should have a brownish body with black on the head and the white stripe should go downwards towards the nape, not upwards towards the top of the head. Everything about the head looks wrong to me for a Great Kiskadee. So...is it something completely different? I can't, on the spur of the moment, think of another alternative. Actually, to throw another option out there, I had originally considered White-ringed Flycatcher except it seems a bit out of range (I understand that White-ringed would typically be found a bit farther south). Here's another picture of the same bird at a slightly different angle. You can see that the white on the head goes all the way around to the back of the head, making a ring. Also, White-ringed are drab brown in colour with very black cheeks, just like this guy. Here's my pic. yeah, while I was searching I was astounded by the number of species that look similar... many of them further south though. And most of them having smaller bills than either the great kiskadee or the boat-billed flycatcher. My daughter saw what I was looking at and she was frustrated too. She said one of the reasons she like the kiskadee so much was because how unique it is. Well, I guess not. HA. For Mexico, here are the three that are likely to be found... In my opinion, only the great kiskadee's bill matches, at least in terms of size. But, do wait for more experienced birders to weigh in... I'f simply found no photos of any of the likely (or unlikely) species that quite match this bird. when you look down further to South America there are more options but none of them looked quite right to me either. The more I look through pictures the more confused I get. Primary length on the wings seems to favor boat-billed more. I really have no idea. And I found this shot from someone's field guide showing left to right Boat-billed, Kiskadee, then Social. I think the OPs bird is actually a Boat-billed FC as well as the bird in the link in the quote above... the linked bird is definitely not a White-ringed IMO. White-Ringeds are much smaller in general and bill size than both the others. I would think a G. Kiskadee would show much more obvious rufous on the wings. I think the bill looks fine for Boat -billed and too large for Kiskadee IMO. I HATE the fact one can not edit a post within only a few minutes of posting it!!!! As size is hard to get a true reading on in a pic... a White-ringed is the size of a House Finch and the Boat-billed FC and G Kiskadee are Meadowlark size... if you are familiar with those. This bird was definitely larger than a House Finch. Meadowlark size would be closer. I appreciate all the inputs and have enjoyed the discussion! I just read this. I looked in my guide for Costa Rica. The Boat-billed Flycatcher's "broad white superciliaries do not quite meet on the nape.) You can see that also in the pic of the guide. I also thought angle of bill made it look thicker. There I never relied that much on rufous due to light etc. Meh, I'm going back. Boat-billed. 😀 It's a tricky one, isn't it? I've been looking at more pictures I took around the same time of for-sure Kiskadees. The more I look at them, the more I'm convinced this guy is not one of them. The rufous on the wings is much more evident in the Kiskadees and the beak is much straighter. Also, the black band on the eyes is blacker and goes back farther. This guy looks too dull brown, to me, for a Kiskadee.